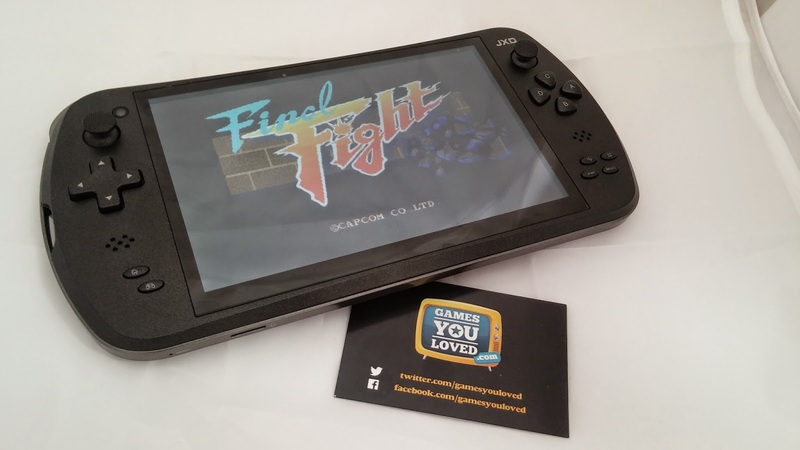 Review of JXD - and Weekend deal exclusive to GYL fans. In this day and age we are all for collecting all the classic games and playing them on the original consoles with the original controllers. That is the best way to play retro games, the nostalgia is there with the feel and the touch of the machines. Pushing in a cartridge into the slot on the Sega Master System, pressing the power button on your Nintendo NES console or even pumping coins into an original arcade cab. These are all the things we remember of gaming as kids and still love to do, but in the present day this is not always possible for everyone and we like to preserve our machines and games of old and keep them in good condition plus access a range of games at any one time. But wait........our delivery from Funstock.co.uk landed. So without delay we opened it up to see an Android tablet ..." But wait ........this had analogue joysticks and a D-pad! We now had in our hands the JXD S7800b ! So this is an Android tablet built for retrogames....we are quite impressed! The console holds well in your hands and is light too.weighing only 500g! Your thumbs lay ontop of the joysticks just right and still leaves your fingers to be hitting the L1 and R1 buttons curved into the corners of the console! The tablet has all the buttons you'd expect from modern handhelds and they are all positioned correctly which will suit most games and gamers! No beating around the bush, this is a very fancy multi emulator in a branded tablet - but JXD have done this very well. As we all know downloading ROMS can be annoying but the JXD makes this simple. The console comes pre-loaded with a cloud app that puts your games into genres and categories for you. All you have to do is simply choose your game and press download! Its that easy. The 8GB of storage gives you tons of space for games and if you want more for movies or such there is a memory card slot too. The JXD is pre set to play Megadrive, SNES, Famicom, Gameboy, DS,GBA, MAME, PS1, N64, Arcade and better still the DREAMCAST! Of course you can download more emu's for other consoles and formats (if you know how to do that sort of thing) and we are told the JXD also supports Speccy, Amiga, 32x and Atari Jaguar!! One of the best features of the JXD is the screen it comes in at a massive 7" and is bright, responsive and colourful which makes the games llok great! If you wish to have more definition you can plug this badboy into your HDMI on your TV and go Large!!! The speakers sit either side of the console giving you good stereo sound. There is a 2.0 megapixel camera on the back and also one on the front if you want to take selfies, there is also an excellent Key Mapping feature if you download Android games that use touch screen controls, but you do have the option to use these on all games....we don't! Battery life is good, we have been playing Crazy Taxi most of the day and with its excellent battery you can play for quite a while! There is not much else to say about the JXD you just haver to play it for yourself to experience it. This is a great retro meets modern gaming console with added emu's to get you started. There are even a few bundled games on there to get you going! Like any emulation system -it plays emulated games, this means sadly that not all games play perfectly or have sound, but this you'll experience across a number of systems anyway. The majority of roms across a range of systems worked. Some didn't so we moved onto the next game - easy.